Dr Slagle includes daily Strontium in any bone support program. Recently the Surgeon General announced that half of all Americans over age 50 are at risk for dangerous and debilitating fractures caused by osteoporosis and poor bone health. Currently, over ten million Americans have been diagnosed with osteoporosis and another 34 million are at risk of developing the condition. The loss of bone density begins at age 35, and accelerates in women after menopause. By age 50, a woman has a 50% chance of suffering an osteoporosis-related fracture in her lifetime. Men are at risk as well, with 50% of men over 50 having osteopenia (below-normal bone density) and 6% with osteoporosis. Recent studies have discovered a natural alternative bone support in strontium, a bone-friendly trace element that is concentrated in human teeth and bone. 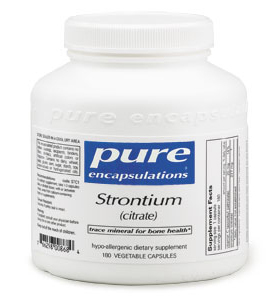 Strontium is similar in composition to two other minerals necessary for healthy bones, calcium and magnesium. Studies show that strontium can increase the absorption of calcium into bones and teeth, making them thicker and stronger. For maximum effectiveness, it is important to take Calcium, Magnesium*, and Vitamin D when taking Strontium. BE SURE TO TAKE STRONTRIUM AT A SEPARATE TIME FROM THESE SUPPLEMENTS. Trial evidence shows strontium ranelate (Protelose-Servier) used by prescription in Europe and the Uk since 2004 is useful for those at risk for osteoporosis. Strontium is called a Dual Action Bone Agent which means it helps to increase bone formation by stimulating the osteoblasts (cells which help to build bone) and by inhibiting the osteoclasts (cells which help to break down bone). A 2 year placebo controlled trial was undertaken including 353 women with osteoporosis who had at least 1 previous spinal fracture and decreased bone density of the spine. Patients received either placebo, or strontium in amounts of 170, 340, and 680 mg daily for 2 years. On follow up, bone density increased with increasing amounts of strontium. By the second year, there was a significant decrease in new fractures of the spine in those on 680mg daily... The authors concluded strontium ranelate increased vertebral bone mineral density and decreased the incidence of vertebral fractures. A three year, double blind placebo controlled trial was conducted with 1649 postmenopausal women which indicated strontium supported healthy vertebral composition and was well tolerated. A three-year placebo-controlled double blind study of 5,091 postmenopausal women showed strontium supplementation supported health hip bones. DIRECTIONS: Take 2-4 capsules per day, in divided doses, upon arising or at bedtime on an empty stomach. Contains no hidden coatings, excipients, binders, fillers, shellacs, artificial colors or fragrance, dairy, wheat, yeast, gluten, corn, sugar, starch, soy, preservatives or hydrogenated oils.